Here at Waldoch Farm we are proud to say we are a Grower/Retailer, which means most of our plant material is grown on site in Lino Lakes. There is a vast amount of seasonal color available at Waldoch Farm. Annuals allow you to recreate each spring with new combinations. 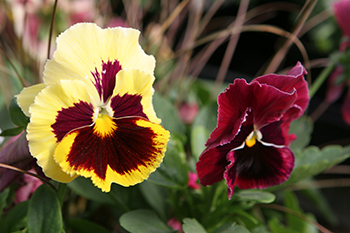 Utilize the vibrant bloom production of annuals to create show stopping color displays not only for your gardens but your deck and patio as well. Intersperse annual flowers amongst your perennial planting for more constant color. 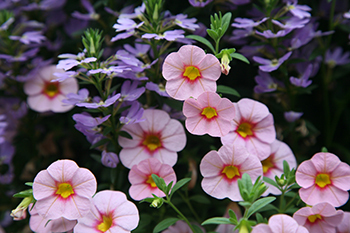 Find varieties of plants here that you may not find anywhere else. Mary and Kathy are always reviewing and growing only the highest recommended new varieties. We have over 350 Mary's Choice selections growing in individual pots. Plus approximately 150 varieties growing in paks. Because Mary and Kathy plant annuals in their own gardens they trial plants to discover which ones grow best in the north metro. Come check out their own gardens each year at our Garden Tour in August.